← This is nitrogen leaching weather, but how much have you lost? Where is Stanley When You Need Him? from etsy.com. These materials are included under the fair use exemption and are restricted from further use. Every year farmers lose thousands of acres of planted corn to bird damage. 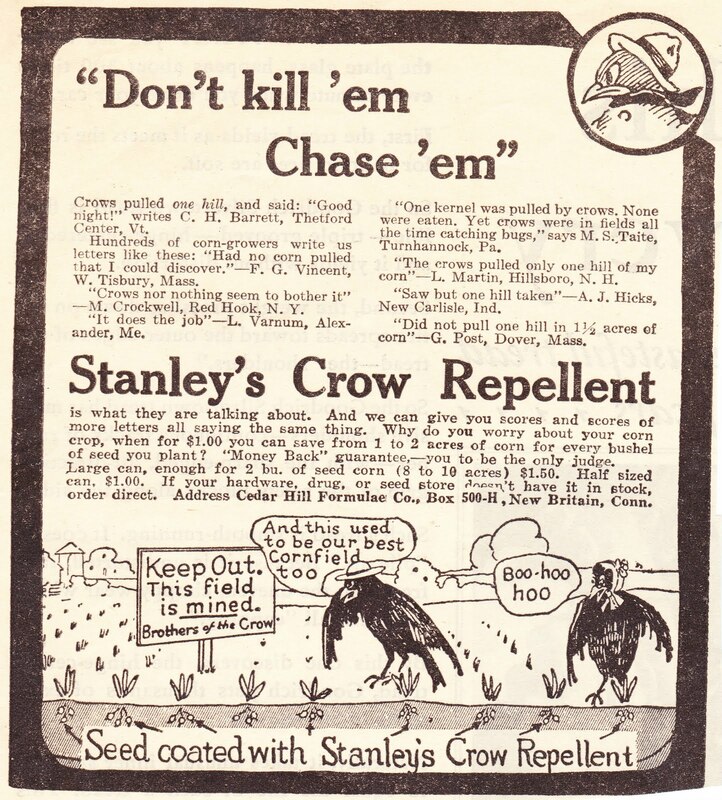 I spoke to one farmer yesterday who said that they lost $6,000 worth of corn seed to crows. Depending on where you are in the country, crows, blackbirds, turkeys, and sandhill cranes can all take a toll on newly planted corn. The corn is not necessarily safe just because the plant has emerged. Some birds pull out whole plants just to eat the remains of the seed that is attached to the plant below the soil surface. Not only do farmers lose the value of the seed, and the yield potential of that crop, but reseeded crops usually have a much lower yield potential than the originally planted crop. from: http://4pb.blogspot.com. These materials are included under the fair use exemption and are restricted from further use. 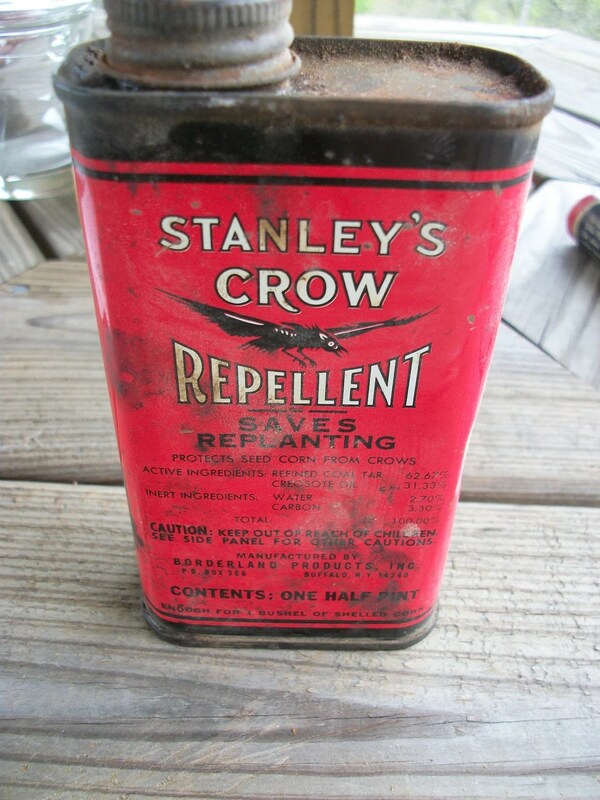 A product called Stanley’s Crow Repellant was used beginning in 1963 until the registration was cancelled in 1986. Alas, the good old days when simple and only mildly carcinogenic mixture of creosote oil and refined coal tar could be used to repel vermin! Well, all is not lost. One enterprising company sells a product called Avipel, in which 9,10-anthraquinone is the active ingredient. While the chemical found in Avipel is synthetically derived, forms of anthraquinone are found in rhubarb and other plants. from arkionls.com. These materials are included under the fair use exemption and are restricted from further use. Applied to corn seed, the mode of action is basically that of a gastric irritant, which causes the birds to look for more agreeable sources of food. It is not lethal. While it is labeled for use to repel crows, other species of birds are also repelled by this product. Both liquid and dry formulations exist for this product. In Vermont, Avipel has a Special Local Needs 24(c) label (rather than a full label) for both liquid and dry formulations, but the label expires on July 15 of 2013. Cary Giguere, Agrichemical Management Chief for the Vermont Agency of Agriculture has indicated that Avipel should have a full Section 3 registration later this year. Of course, if there were other similar products of which I was aware, I would list and/or describe them here. Mention of Avipel (and Stanley’s, for that matter) does not constitute an endorsement of one product over another. Always follow the label!